This book is a very welcome tool, which will enable health professionals to understand the complexity, challenge and rewards of proactively managing long-term conditions. Putting this knowledge into skilled practice, in partnership with patients, will transform the lives of many individuals and their families, and thus fulfil the fundamental purpose of nursing. 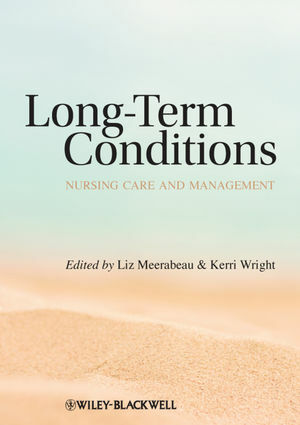 Long-Term Conditions is a comprehensive, practical guide for nurses and healthcare professionals on the care and management of people with chronic illness. It explores case management, individual care and management, the role of the ‘expert patient’, quality-of-life issues, counselling skills, self-management, and optimum self-care. Long-Term Conditions discusses the three main long-term conditions currently resulting in most hospital admissions: diabetes, respiratory, and coronary heart disease, with a focus on empowering the patient to self-manage. Kerri Wright is a Senior Lecturer in the School of Health, Social Care and Psychology at the University of Greenwich. She is a qualified district nurse and has a particular interest in nursing in the community setting. 1 Long-term conditions in perspective (Liz Meerabeau). 2 Case management (Kerri Wright). 3 Changing approaches to the management of long-term conditions (Kerri Wright). 4 Sociological insights (Liz Meerabeau). 5 Psychological effects of long-term conditions (Ben Bruneau). 6 Counselling skills (Val Sanders). 7 Living with long-term conditions: Tommy’s story (Tommy Magee). 8 Self-management and current health care policies (Kerri Wright). 9 Managing common symptoms of long-term conditions (Kerri Wright, Pia Sweet, Natasha Ascott, Harry Chummun and Jenny Taylor). 10 Medicines management (Shivaun Gammie). 11 Management of heart failure (Susan Simpson). 12 Management of respiratory disease (Liz Nicholls). 13 Management of diabetes (Lynne Jerreat).